No more sticking my head in the sand. Christmas is definitely on its way. Even the weather seems to have a festive chill about it but thankfully no sign of snow yet. 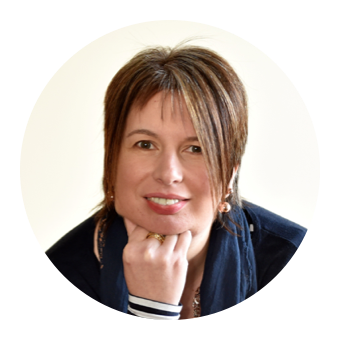 There seems to be an endless round of festive fairs at the moment all with requests for home baking, raffle prizes and donations for the chocolate tombola. 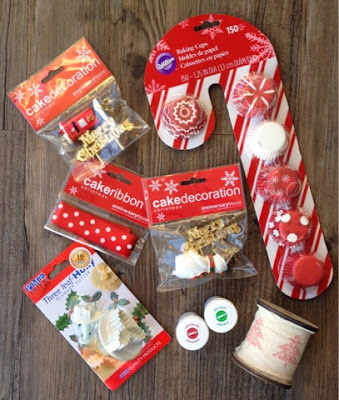 Our school held its Christmas Fair at the weekend so with the help of boy and girl and some festive cake decorating goodies supplied by Hobbycraft we set to work on our contribution for the cake and candy stall. Our first item is a crafty make rather than a bake but it contains food so I feel justified in its inclusion. 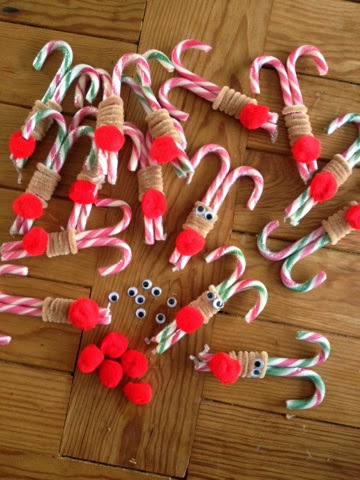 Rudolph Candy Canes. So simple but really effective. 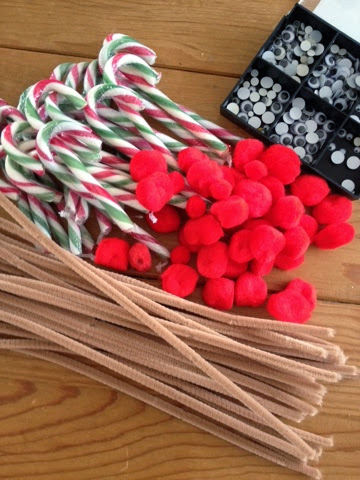 Candy Canes from the pound shop and googly eyes, pipecleaners and pom poms from Hobbycraft. Top tip. Glue the candy canes together first. Hot glue gun works best for this and for attaching the eyes and nose. 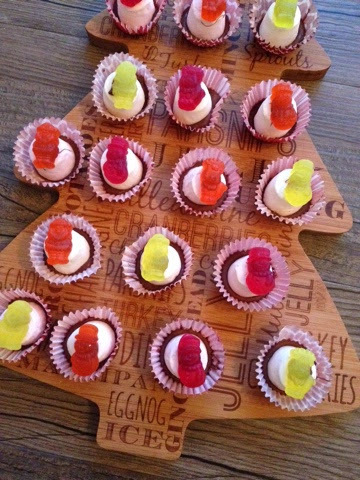 Next came top hats with a festive twist. Into the cute wee festive paper cases went melted chocolate, followed by a marshmallow, more melted chocolate and topped off with M&S Jolly Jellies shaped as Santa, Snowmen and Reindeer. 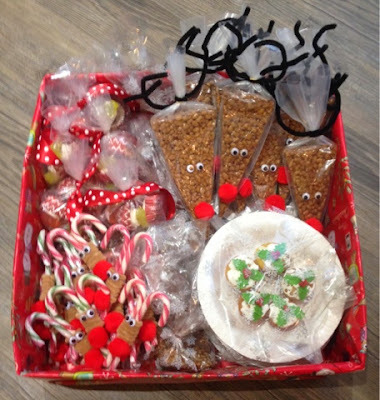 Pop them in cellophane bags and tie with spotty festive ribbon. Mars Bar Krispy Reindeer were next on the menu. This is a no bake cake which we cut into triangles and placed into disposable icing bags from the pound shop. 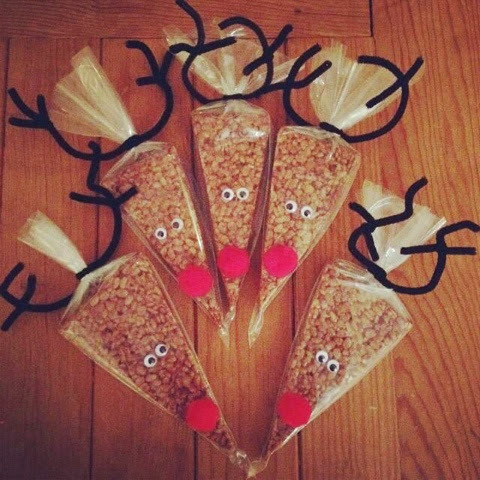 More pipecleaners, googly eyes and pom poms plus the hot glue gun turn rice krispies into reindeer. Roughly chop up the mars bars and melt them in a pan with the butter and syrup. Remove from the heat and mix in the rice krispies. Press into a greased tray-bake tin. Melt the chocolate and spread over the top. Once set cut into squares - or reindeer! 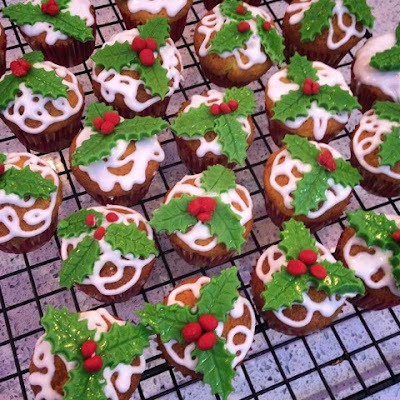 Last but by no means least came Mini Jolly Holly Cakes. Boy and Girl both love working with fondant icing so this was right up their street. 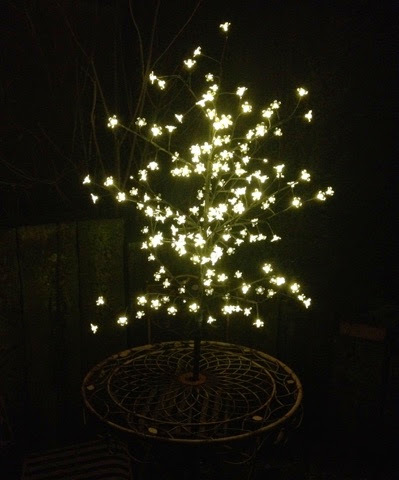 The holly plunger cutters were very easy to use and the resulting holly leaves looked really effective. Mary Berry's fairy cake recipe was used for the mini cakes and squiggly icing secured the decoration. Disclosure : Thanks to Hobbycraft and UK Christmas World for providing products for this post. All views expressed are my own. Claire you're a Christmas food genius. So creative, I love them especially the Mars reindeer. Can I move in with you and eat reindeer pancakes and snowman pizzas all day every day please?